Gary Bucciarelli often has staring contests with Los Angeles’ only species of newt, Taricha torosa better known as the California newt. And there’s plenty to be intrigued about these velvety newts that are filling SoCal streams, pools and waterways. The welcoming rains have been making magic for SoCal amphibians, including the endangered red-legged frogs that have been laying eggs like crazy. Water-loving newts also have been extremely active at breeding sites throughout the area, a good sign for this Species of Special Concern that’s seen its populations slowly decline in the last 15-20 years. Bucciarelli knows that now is the time to observe the newts, because once mating is done, the newts return to their subterranean homes only to resurface the following year. How they live and survive has been a big mystery, but scientists do know one big thing: these little critters have longevity. 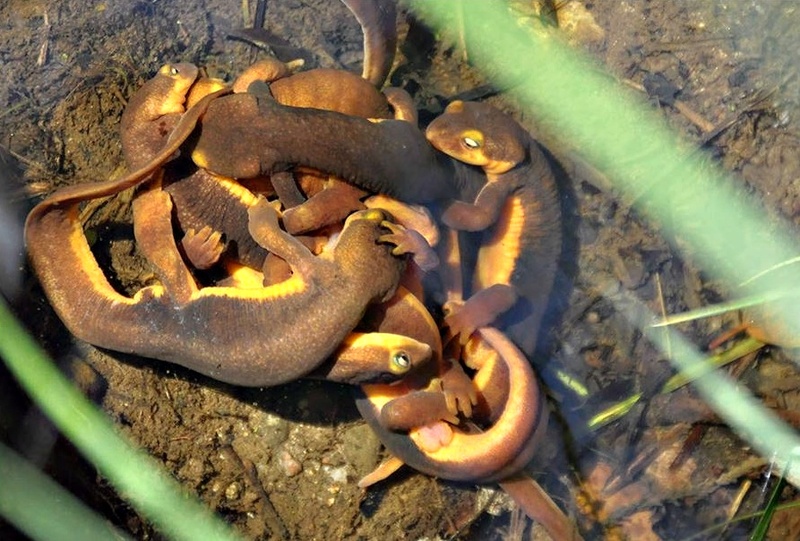 For years, SoCal biologists have captured and chipped thousands of newts. Newts have been discovered recently that had been chipped in 1995, 1992 and even 1991. “These guys have super long lives relative to other types of amphibians,” sums up Bucciarelli. Is it from all that underground living? Special diet? Biologists are still scratching their heads. But there’s another big mystery about newts – they are poisonous, and their toxicity is the same kind found in puffer fish, shellfish, sea worms and sea stars. Yes. From the OCEAN. It’s not sure how these fresh water aquatic beasts evolved with this saltwater status, but the defense has certainly come in handy. 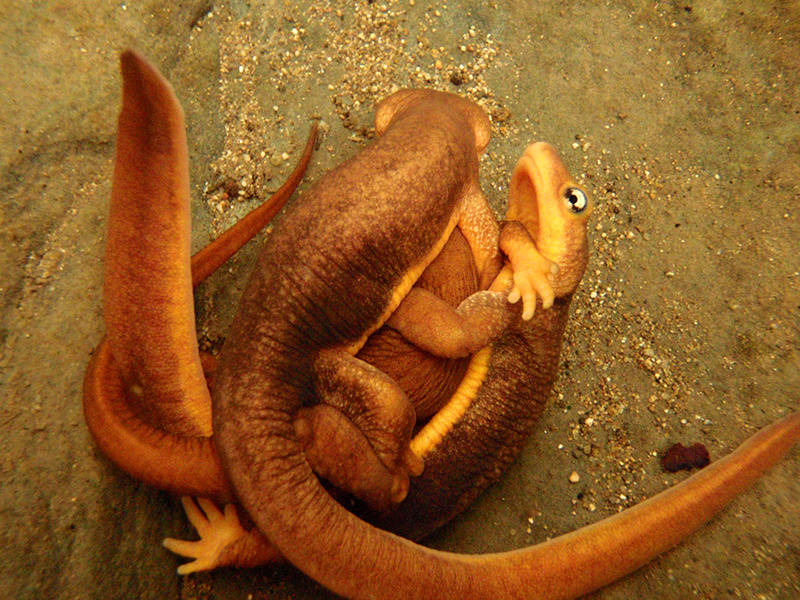 Predators know to stay away from newts, often seen in the traditional “stay away from me” colors of red and orange. (Note: newts have to be ingested for their toxicity to be released. But that’s no excuse for humans to pick them up and handle. ) One predator, however, is immune to the newt’s poison: the non-native crayfish. Introduced into local streams and ponds decades ago, this voracious crustacean had been wreaking havoc on not only the California newts but other native fish and frog species, gobbling up youngsters, eggs, larvae and food. But the rains have flushed multitudes of crayfish from their crevices, allowing some natives to reclaim their rightful territory. “Everyone is crossing their fingers,” says Bucciarelli about the seeing possible reduction in crayfish numbers. Over the years, numerous management efforts as well as volunteer groups have done their share to rid crayfish from SoCal streams, ponds and waterways, giving the natives a fighting chance to survive. But for now until the end of May, it’s still the season for newt love in breeding ponds around SoCal. Bucciarelli stresses that hikers who come across mating newts are best to stand back and engage newts with only their eyes, preferably in a staring contest. Don’t blink.